What does it take to survive in the fleeting world of Indian television? Ask Gajendra Singh, director of Antakshari, Zee TV's long-running musical game show and he says, "Success. There is no such thing like 'you have to flow with the tide'." Antakshari remained untouched during the shake-up at Zee last year, when almost every other programme was axed to make way for a new look. The show recently celebrated its 10th anniversary. The secret of their success, says Singh, is that through all these years, the show has retained its roots. "We may be using modern techniques for shooting, but the soul is still the same," Singh says. Antakshari, Singh observes, is not merely a song and dance show - it is a show that reaches out to the hearts of the viewers. Pointing out their efforts to connect with the people , he says, "For one show, we had flown down non-resident Indians (NRIs) from 12 countries to Mumbai. They had come from places as diverse as Australia, Kenya, Canada and the UAE. Some were from Bangladesh, Nepal, Mauritius, UK, USA and South Africa. They were all selected after auditions in their respective countries." Singh explains how, for may of these NRIs, it was their first time in India. "Their enthusiasm was overwhelming. They were people who speak English and French, but don't know Hindi. They learnt Hindi songs especially for this. It's a great feeling." We understand Singh's moment - sorry, moments - under the sun. We definitely want to know more about them, but also a few things besides them. Vickey Lalwani catches up with Singh at his Zee TV office to get an insight. How did you conceptualise 'Antakshri'? I don't know why anybody did not conceptualise it before me. Antakshri is a game which our fathers and grandfathers played. Today we and our children play it. Tomorrow, I am sure our grand children would. And you took it to Zee TV? Actually, I first took it to Doordarshan way back in 1987. They did not give me a favourable response. Those days, Zee TV did not exist. Much later, I took it to Zee. Not really. First, I joined them in their In-house Productions Department, in 1992. After six months, I told them that I need to move on. I am a creative person and was itching to do something innovative. At this point, I mentioned my Antakshri concept to them, which was still looking for an outlet. They agreed to give me a platform. Has 'Antakshri' made you famous? That question is for you to answer. But I must say, I am bowled over by the love I receive from people. For instance, once I was given a bouquet of flowers by a gentleman who said his mother made it a point to see my programme even during her last stages of cancer. Sometime ago, we had invited 10-year-old kids - who were not born when the programme first went on air - to participate in an episode. We receive nearly 600 entries for that! That's where I rest my case. How did 'Sa Re Ga Ma Pa' materialise? The Sa Re Ga Ma Pa idea came up when I realised that many good singers kept away fromAntakshri. I have observed that good singers never take to singing as a game. They are more concerned about the sur and the music. I wanted to give them a platform. Why haven't you tried your hand in other channels? Or are you a Zee loyalist? Is your involvement at Zee restricted to being the director of your particular show? No. Recently, I have been appointed as the creative director. My job especially involves looking into the promos. Richa, Vasundhara, Babul Suprio, Daler Mehndi, Anil Khera, Gajendra Singh, Usha Uthup and 'Hum Dil De Chuke Sanam's folk singer on the sets of Antakshri's singer special episodes "Creativity has to be built around commercial requirements. A truly creative person can do that"
You talk about creativity, but doesn't commerce overrule it? Commerce doesn't overrule creativity. Nevertheless, it is very important. A public limited company cannot discount commerce. So, creativity has to be built around the commercial requirement. A truly creative person is one who can successfully do that. I surely don't subscribe to guys who claim to make a project for only personal satisfaction. Then, why release it to the public? Do you think Zee has suffered in the recent past due to poor promotion? I don't think so. And even if it has, it's just a passing phase. How much did 'Antakshri' help in Zee's popularity? Tremendously. But it was the other way round as well. It takes two to tango. The channel never let my programme down. It was always ready with suggestions, innovations and encouragement. After all, you can't showcase your talent if somebody does not recognize it. Why was Sonu Nigam dropped from 'Sa Re Ga Ma Pa'? Nigam was not dropped. He himself wanted to be out of the show. He said he wanted to concentrate on movies. Do you agree that Annu Kappor stood tall against the ever-changing faces of female anchors in 'Antakshri'? Why? Initially, we had Durga Jasraj. But there were a few complaints - or say, notes of dissent - regarding her singing. Also, she had problems with her dates as she was regularly travelling with her father, Pandit Jasraj. Then I approached Renuka Shahane. She instantly agreed but made it clear that she would do it for a year only. She said she had other commitments. Thereafter, I felt it wouldn't be a bad idea to change the female anchors every year. And thus came Shefali Chhaya, Rajeshwari Sachdev and Richa Sharma and Pallavi Joshi in quick succession. But hasn't Pallavi Joshi already anchored the show once before? That's okay. I just thought that she should be brought back. Everything cannot have a reason. Life is not science. "Zee never let my programme down. It was always ready with suggestions, innovations and encouragement"
How did the serial 'Awaaz' happen? 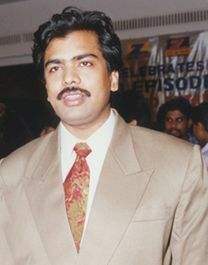 Awaaz was initially Anil Chaudhary's concept. I came across the script which made me sit up and pay attention. I knew the audience too would pay attention. If it was Anil Chaudhary's script, why didn't Zee allow him to go ahead with the serial? Chaudhary said he would not be able to handle it alone. He gave the project for production to Zee TV. Zee, in turn, asked me to write and direct it. ... And yet, people are talking about it; they are watching it! Awaaz is not your average run-of-the-mill soap. It's seriously different. It asks you a question - "If people on a deserted island, without basic amenities of life, can live cohesively and happily, why are we bitching, quarreling and killing despite having facilities of every kind?" Do you know the response I am getting for the serial? It's overwhelming. I am flooded with fan mail. Do you have an end in mind for the serial? Or is it one of those endless soaps? I have an end in mind. It should go on for about a year. I am planning to direct a film. I am working on the script with some Pakistani writers. Under the wraps! I won't like to spill the beans, or else others would pick it up. Would your new post of creative director at Zee stop you from taking up some project on other channels? Well, I met my wife Ashwini in a Antakshri show. She was a participant. We had a courtship period of seven years (blushes). It started when she began working in the research group behind the screens. Even today, she helps me with my work.